On our upcoming trip to Vegas-in two weeks-Gerry and I will be investigating a murder...well not technically, of course. 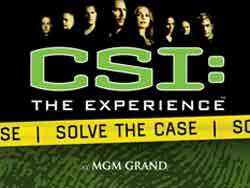 We will be partaking in the CSI exhibit (based on the hugely popular television show and its various spin offs), at the MGM Grand, Las Vegas. The CSI Experience involves you in the hands on science, the challenges and thrills involved in solving a crime mystery. At the exhibit you can be assigned to one of three different crime scenes each with a unique storyline and clues. During the experience you get to try advanced scientific technology, numerous scientific disciplines used by criminal investigators and forensic scientists today. 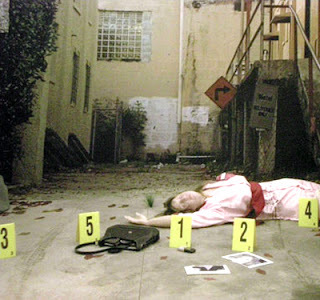 Visitors will use the scientific process to identify evidence at the crime scene and determine which should be further studied. They will then analyze the evidence in a multidisciplinary crime lab with the help of forensic scientists. The evidence gathered will help formulate a working hypothesis –which can be then validated and communicated to their superiors. During the exhibit the visitors can try on various scientific jobs including toxicology, forensic anthropology, forensic entomology, forensic pathology, forensic art, firearm and tool mark identification and well as blood splatter analysis. It is a perfect opportunity to try different jobs that we only see on television. The overall goal of the exhibit is to promote public awareness in the advances in forensic science and advance critical thinking skills. Also, it will be the perfect opportunity to see whether we can believe everything we see on TV.